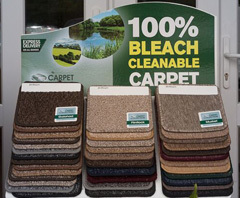 If you use bleach on the polypropylene fibres, it may soak down the fibre into the carpet backing and underlay, which are not resistant to the bleach chemicals, and enough of it can cause disintegration. Using bleach on any carpet fibre that isn’t polypropylene, will result in striping the colour from wool and wool-mix carpets. It can give children and family pets ‘chemical burns’ if their feet, hands or any other skin surface touches the bleached area. It is possible to ‘neutralise’ the chemicals, but you will need to do this process to all areas where you have used bleach, or the chemicals will remain active. Breathing in bleach solution can damage your lungs, bring on an asthma attack, damage the nervous system, give you headaches and migraines and cause vomiting. Basically, if your nose can smell it, it is harming you. Bleach will pollute the air and water supply and was used as a WW1 poison. Would you really want to use this in your family home? 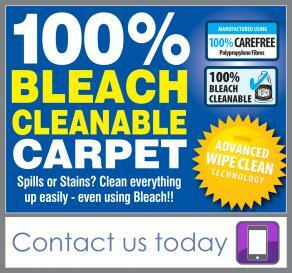 Bleach can disinfect by killing microorganisms, but it has no detergency and so has the same cleaning effect as water!